Thank you for being a kistchy pop artist, whoever painted this beautiful piece of artwork featured at the Delux Cafe in the South End of Boston. God Bless America. Delux Cafe is a dive bar in Boston's South End that has a beautiful mix of kitschy vintage knick knacks and decorations. Including a starlight lamp cover that I once had in my childhood bedroom. It was wild to see it again. Took me back to so many memories! Memories, especially, of sitting in my bedroom and writing in my journal. Things change, but then again they don't. 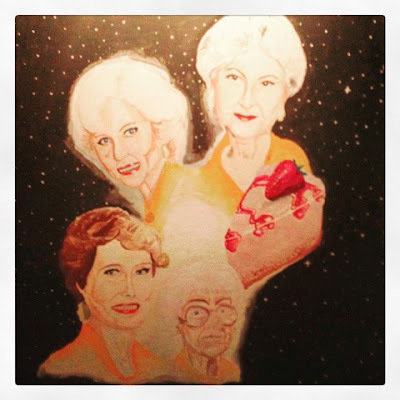 One of their best pieces at Delux Cafe is this beautiful piece, featuring portraits of the Golden Girls with strawberry cheesecake on a spacy background.